Tonight the overnight temperature is predicted to go well below 40 degrees. I decided that I wouldn’t risk my roses another day, but brought in the last blossoms on the bush. The rose is a “Peace Rose” and the flowers meld from peach to yellow to pink as the bud swells and opens. The rose also has a gentle fragrance, too. 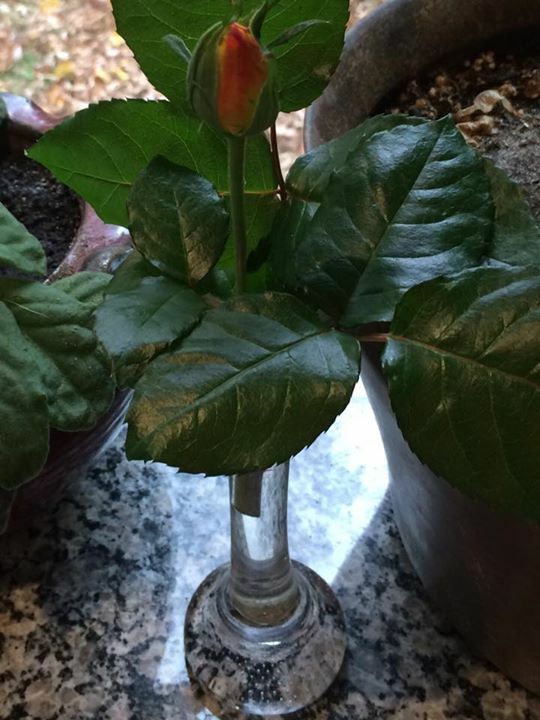 But it’s November 1st, and the reality is that we are deep into Autumn, and the rose is done blooming for the year. It’s later than most years. I’ve loved looking at it out my kitchen window all summer. I went out and clipped the last blossoms of the bush and brought them in… I inhaled the fragrance and admired the glossy leaves, the tiny thorns. It was one last gasp of beauty before we have the cold, chilly days and long evenings of winter. I love this Deb. Your words to ‘stop and smell the roses’ are quite poignant to me because I miss their smell so much since developing a brain tumour but memory is a wonderful thing because I can remember how they smell. I love the Peace rose – quite an old variety I seem to remember – but it is difficult to grow roses here in Wales because of the ‘South Westerly’ weather! Love your blogs.